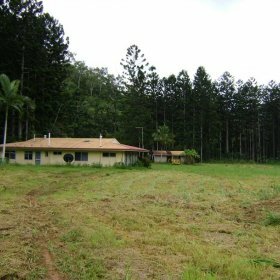 Lambert & Rehbein (SEQ) Pty Ltd was commissioned by Denbass Pty Ltd to conduct a Detailed Ecological Assessment (DEA) for a property located at the western end of Redlynch – Intake Road, Redlynch (Cairns). The property is further described by the Department of Environment and Resource Management (DERM) as Lot 2 on NR5253 – ‘the site’. In total, the site comprised approximately 3.34ha of land with a residential dwelling and associated ancillary shed within the north-eastern portion of the site. 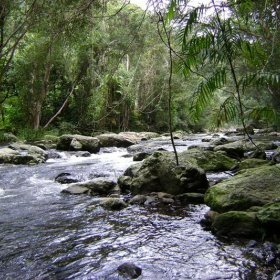 The south-western extent of the site comprised relatively pristine riparian rainforest fragments immediately adjacent to Redlynch-Intake Road and Freshwater Creek. 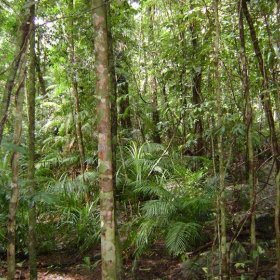 Denbass Pty Ltd proposed an Ecotourism style facility including eco-villa accommodation and a restaurant/function facility set at the base of the Lamb Range – a listed World Heritage Area and pristine rainforest fragment. Lambert & Rehbein conducted an initial detailed diurnal assessment on the floristic composition of the site and took note of opportunistically observed fauna species. A species of note included a northern species of Double-eyed Fig Parrot (Cyclopsitta diophthalma macleayana) which is a listed vulnerable species under State Legislation. The careful planning and positioning of disturbance footprints, management of legislative requirements of the site and close liaison with state government agencies resulted in the successful application of the development to Cairns Regional Council and DERM whilst protecting and enhancing the site’s biodiversity assets.